You know those nooks in your house that you act like don’t exist. The spots that if they showed their face on the world-wide web you would be mortified. We all have them. Ours was bad enough to become a hazard while we were painting the exterior. 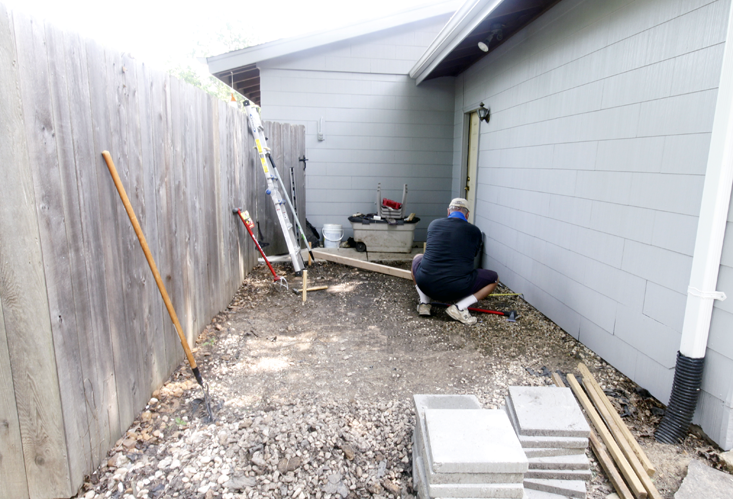 We have a small walkway between our garage and the privacy fence of our backyard. Privacy meaning we never really had to look at the leaves and yard tools, and yes even junk piling up. So I was brave and snapped a few photos of the most disturbingly unkept area of our house. Then of course I started tackling it with a trash can and rake so we could get that yellow off our house. The weirdest thing happened though, the pictures are gone. Seriously, I wanted to put our junk out there for all to see. We are talking broken pool basketball hoops, huge plastic bins, loads of five gallon buckets, old tarps, and monster rocks. It was like our own little graveyard, where trash just amasses and breeds. I have checked six different memory cards, which happens to be all of them. Nowhere to be found. The problem is that we spent a week cleaning out trash, painting our siding, and scooping up five hundred pounds of rocks till we hit dirt. Those before pictures are just a distant memory now, because we are not undoing that work. Let’s just use our imagination shall we, trash and leaves making babies. After we cleaned up that little spot, I started seeing all of its potential. 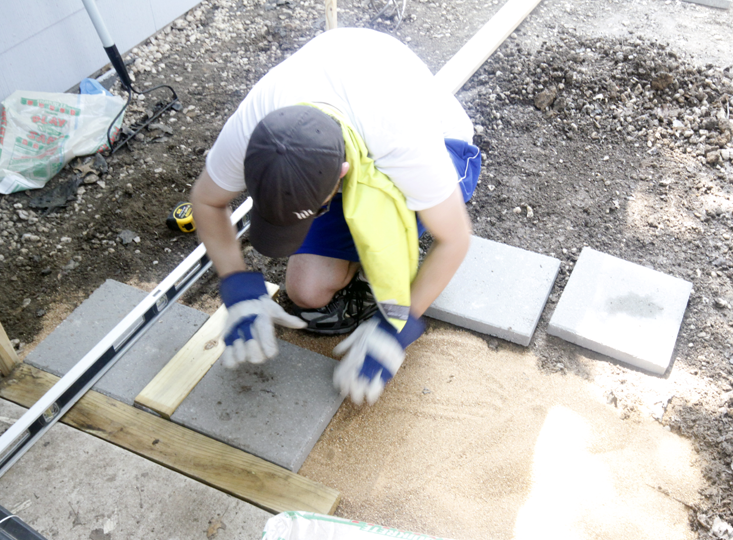 So I put Tim to work…with pavers. What did I do while my dad and fiancé had a little bonding time? I painted of course. Hello, little bit of sunshine. Now I am even more motivated to get that area Glamor Shots ready. Have you done any fun paver projects? Like bright doors? What color is your door? Is that rusty brass light driving you crazy? How about those plastic tables? love that door! what’s the color called? You know….I just went down and got the can and sad news…it is not on there! I know it was a Pantone paint chip and I know the name had some sort of nautical ring to it because I told my dad “it was meant to be”. Next time I run in Lowes (which will probably be Saturday) I will grab a chip and let you know! I truly madly deeply just fell in love with that door color. Get something coral-y (colored or literal) in there stat! omg I’m coming over to pet your door… Or painting my own but it wouldn’t look that good, I know it. Gah. You’re amazing! 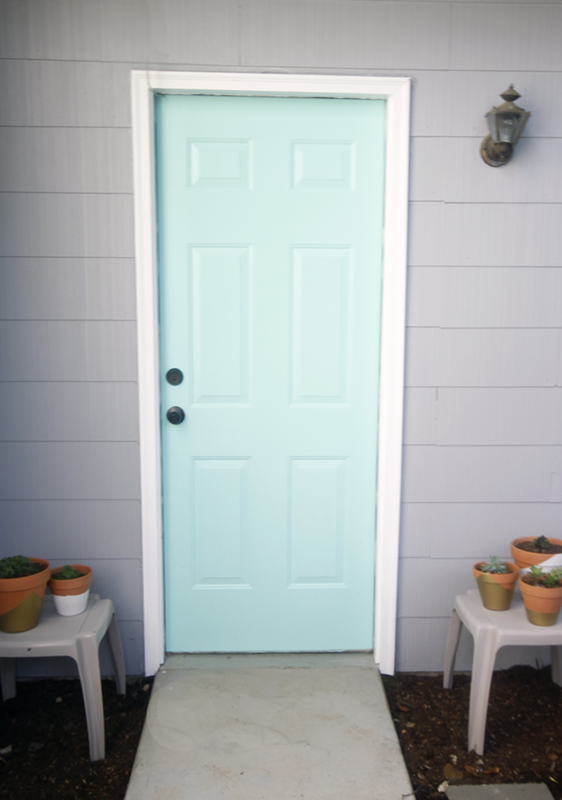 The door color (at least in the photo) looks like the aqua color behind your blog seahorse and the seahorse is coral-colored-ish. Thus the idea. Good luck finding cool stuff! Oh my goodness, there is awesome potential there. That door color is perfect!! Love it! Thanks so much!!! I think so too…can’t wait to see what we can do with it!